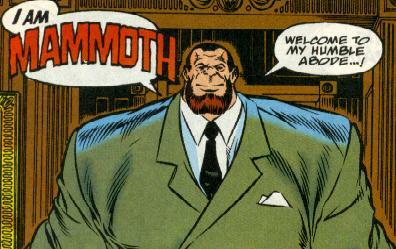 Powers/Abilities: Mammoth possesses superhuman strength (clas 50?) and durability. He wields a variety of powerful energy weapons in combat. History: (Blackwulf#1)- Mammoth accompanied his teammates Sparrow and Blackwulf in battling the Peacekeepers, who had attempted to capture geneticist Dr. Caitlin Maddox. Mammoth fought Wraath of the Peacekeepers, who claimed to be Mammoth's "temporal brother", although Mammoth did not believe him. Ultimately, the Underground Legion escaped with Dr. Maddox. When Dr. Maddox awoke at Mammoth's mansion, headquarters of the Underground, Mammoth gave her a tour of his home, and introduced her to Touchstone, Toxin and Wildwind. (Blackwulf#2)- Mammoth learnt from Sparrow that Blackwulf was dead, killed by Tantalus, and he assumed leadership of the Underground. He decided to leave Sparrow out of their next mission, for her own good. Mammoth led the Underground to Wright-Patterson Air Force Base, where they encountered Lucian, the new Blackwulf. Mammoth let him join them, but promised to keep a close eye on him. The Underground fought the Peacekeepers, but failed to prevent them from capturing one of the bodies. They fled the base in a stealth fighter to avoid arriving soldiers, but were shot down by the villain Scorch. (Blackwulf#3)- As the Underground emerged from the wreckage, Mammoth was heartbroken to find Wildwind dead. They fought Scorch to a standstill, but were forced to surrender when reinforcements arrived, and they were imprisoned at the base. (Blackwulf#4)- Mammoth and the rest of the Underground were set free by Dr. Maddox and the Prime Skrull, and Mammoth saw to it that the Underground waited for Blackwulf to retrieve Wildwind's body from Scorch before departing. (Blackwulf#5)- Mammoth joined the Underground and Giant-Man in setting after Sparrow, who had gone missing in Ottsville, Pennsylvania. They discovered that the townspeople were being controlled by Ultron's living circuitry, and Mammoth broke Ultron's control over Sparrow by telling her that Lucian had killed Pelops and taken the name Blackwulf from him. Giant-Man was able to mend some of Ultron's damage by making the people of Ottsville think they had their free will, but Ultron escaped. (Blackwulf#6)- When the Underground returned to the mansion, Mammoth was overjoyed to find that Wildwind was alive, and she flirted with him, neither aware that she was really an artificial being. Giant-Man wanted to take Sentry#459, recovered from Ultron, into custody, but Mammoth and Dr. Broadhurst convinced him to turn the Sentry over to them. (Blackwulf#7 (fb))- Learning that Tantalus had used earth's Stargate to return home, Mammoth rallied the Underground to set after him. He was annoyed to learn that Sparrow had driven Blackwulf off, and she walked out on the team as a result. He also demanded that Dr. Maddox remain out of their mission, but she trailed after them secretly. (Blackwulf#7)- Using his status as heir to the Amos fortune, Mammoth attended a fundraiser at Club Galaxy, where an actual space shuttle was on display. The twins Stacey and Tracey Hoeffner were attracted to Mammoth, and he kissed them both before making off with the shuttle alongside the Underground. As they traveled through space, the Underground met up with the Kree Starforce, who joined forces with them to seek out Tantalus at his homeworld, Armechadon. (Blackwulf#8)- Mammoth joined with the Underground Legion, Starforce, and the Underground of Armechadon against Tantalus and his Peacekeepers on Armechadon. (Blackwulf#10)- Mammoth joined the Underground in battling Tantalus and the Peacekeepers, but Wraath attempted to remove Mammoth from the playing field to spare him from his fate. However, Sentry#459 fended Wraath off, and Mammoth returned to the fray. 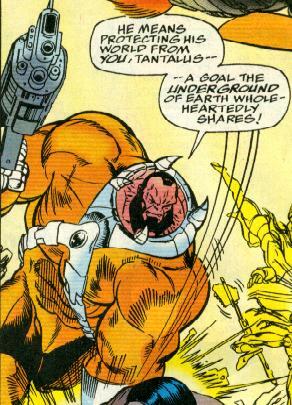 To save Touchstone from Tantalus, Mammoth blasted a hole through Tantalus chest, but Tantalus then turned and used his Black Legacy on Mammoth. To save his life, Blackwulf sliced Mammoth's left arm off before the Black Legacy could spread. Ultimately, Blackwulf slew Tantalus.